I had been a classroom teacher at Uralba Primary School, Kambah, and it was when I began there in 1981 that I found that music was not taught in a serious, sequential way, as one does maths or reading. So I instigated daily lessons to grade 2 whereby the children listened daily to beautiful Baroque or Renaissance music played on recorders in various combinations, and learnt to read music and to play recorders of different sizes. Those children who stayed on for more lessons before and after school and at lunchtime, over the subsequent years, gained very good musical skills, and, dressed in elaborate Elizabethan costumes made by the parents, became well known as a performing group at ministerial and other public functions. They won every competition and Eisteddfod, including the National, Sydney and Goulburn. Film Australia made a documentary of the children and my methods. In 1991, I was awarded a Churchill Fellowship to study in Britain the teaching of musical literacy to primary school children using the recorder. I retired in 1992 to care for my husband, and in 1995 I was asked to teach the recorder to 8 members of the U3A (the University of the Third Age is a voluntary organisation for retired people, where tutors give their services for nothing, and people partake of classes for no fees.) This was the nucleus for today's total of 160 retired people who now learn from me. Each year I offer classes from total beginners to the 68-strong Advanced Orchestra. People move through the groups as they feel the confidence to play the increasingly difficult music. Some have been with me for 17 years. My oldest member is 87. Three classes are held at my house, and three at the Woden Seniors' Club. The usual sizes for recorder ensembles are soprano (also called descant), alto (treble) tenor and bass. During my visit to London for my Churchill Fellowship, I had seen a recorder orchestra for the first time, and hoped that one day I might obtain all the deep instruments to form one. The members of the Recorder Orchestra some years ago knew of my wish to have the large and sonorous great bass and contra bass recorders so that we could play a more interesting repertoire. These cost thousands of dollars, so I applied for grants, receiving some welcome funds from the local government and from the Southern Cross Club, but not enough to cover the total cost of these instruments. A number of my musicians decided to take the fund raising into their own hands, and instigated a weekly fresh produce and handcraft table which was a type of 'bring and buy' stall in our rehearsal venue, the Woden Seniors' Club. This became a lovely focus for the sharing of home grown, home cooked and home sewn goods. Many friends donated money, and eventually we had enough for both a great bass and a contra bass. Two more were generously donated recently when one our members had a stroke and could no longer play. So now we now have a beautiful assortment of recorders. The largest are the unusually shaped and rather rare contra basses. Recorder orchestras are unusual musical phenomena, and as they become better known, composers are writing music for them as well as arranging well-known works for the full range of recorders. ..."I wrote this suite for Margaret Wright, who lives in Canberra, Australia. 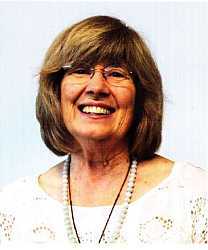 Margaret is an inspirational and dynamic leader of recorder groups in Australia, and she specialises in working with 'seniors' in all sorts of groups in terms of both their size and their playing standard. I wrote the 'Canberra Suite' with her larger groups in mind (including, as it does, parts for great bass and contrabass), but I think that it would also work well with a one-to-a-part sextet. Whoever plays this suite - in Australia or elsewhere - I hope you enjoy it!" In December last year we played for the Lunchtime Live at Wesley concert series, and shall do again on Dec 3, 2014. Each year we have special events. St George's Day in April is a feast of scones, jam and cream and English music through the ages. In the spring, we spend an afternoon cruising on Lake Burley Griffin playing Handel's 'Water Music' and other 'watery melodies' such as 'Yellow Submarine', 'Skye Boat Song', 'Bound for Botany Bay', and 'For Those in Peril on the Sea' . We also host recorder players from Sydney, Goulburn, the Coast and all around Canberra for full days of recorder playing. Our May event, Combined Recorders Playing Day, attracts 80 -90 players, and I arrange easier parts for learners so that everyone might have the experience of full orchestra playing. Each October, I conduct two bands of recorders playing magnificent works by Gabrieli, Hassler and Viadana, such as were heard in St Mark's, Venice. This is our 'Double Choir Day", with 80-90 players again. Some modern composers have written double choir works for recorders, so we often include them. Recorder players at these events enjoy the unusual experience of large orchestral playing. This is something denied most players. We were invited to play aboard the ferry 'Jenny Ann' on Canberra's One Big Day 10th March, 2013 to celebrate the centenary of Canberra's foundation. We played Renaissance dances as the ferry cruised close to the shore. On 24th April we played a 40 minute concert in the Canberra (Shopping) Centre as part of the Musical Offering. Performances by a wide variety of musicians occurred each day throughout 2013, in different venues, as part of our city's centenary celebrations. For several years now we have played inside Government House on the Open Days organised by the Australiana Fund. We have demonstrated our different and unusual recorders at schools and retirement homes. In late 2014 film was made for U3A , and the recorder players and I were selected to demonstrate the idea of reciprocity. I conduct classes, and I also attend/have attended classes of interest to me such as art, history, French and as a violinist in the U3A Symphony orchestra. It has been my continuing delight to teach so many people the difficult skill of learning to read music and to play recorders. They are thrilled to be part of the orchestra playing beautiful music from many eras, from Mediaeval, through Renaissance and Baroque to modern. I continually congratulate them on their persistence to gain the skills to play these very difficult instruments so well, especially as older adults! Our tea breaks are lively with chat and socialising. For many, recorder playing has become the highlight of their week. In 2011 I was thrilled to be awarded the Order of Australia for my contribution, with recorder teaching, to 'healthy aging'.